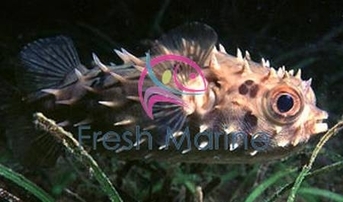 https://sep.yimg.com/ay/yhst-33477391359232/spiny-box-puffer-chilomycterus-antillarum-bridled-burrfish-striped-burr-fish-9.jpgSpiny Box Puffer - Chilomycterus antillarum - Bridled Burrfish - Striped Burr Fish DifficultSemi-aggressive75 Gallon9.8 inchesNoCarnivore, Meaty, ShrimpCaribbeanDiodontidaeSmall 2" - 3"
The Spiny Box Puffer is also known as the Striped Burrfish. Its body is yellow in colour and it has a tan with dark striping over it. It has short and fixed spines which protects it from larger, more aggressive fish. The Spiny Box Puffer has short, fixed spines which help protect it from larger, more aggressive fish. Its teeth resemble a fused beak. It uses its powerful teeth to feed primarily on hard-shelled mollusks, sponges and coral. The Spiny Box Puffer differs from its cousin the Porcupine Puffer in its physical structure. Its spines are always erect whereas in porcupine puffer, they lay against the body until they inflate. The Spiny Box Puffer is also less frequently available. It is more difficult to keep than the Porcupine Puffer. The Spiny Box Puffer is often quite slow to adjust to captive fare. It is not advisable to feed them more than three times a day. The Spiny Box Puffer has the ability to inflate its body with water or air, it does this process to intimidate predators. Once it inflates its body, it would appear twice its original size. This ploy would be done by this fish as a last resort only, because it would lose all its maneuverability in the water. It is a nocturnal hunter, just like other puffers. The Spiny Box Puffer would nip at slow-moving fish and long-finned fish, but is not aggressive with others in its own family. It will eat invertebrates found in a reef tank. So it is not well suited to the reef aquarium. The Spiny Box Puffer is an oddly shaped fish. This fish is found in tropical and subtropical waters worldwide. The Spiny Box Puffer often lingers around coral reefs as they prefer shallow inland waters with depths ranging from 5-30 feet. Maximum Size: The Spiny Box Puffer grows up to 6 inches. General Size Specifications: This fish will come to you generally between 3-5 inches. Minimum Tank Size: The Spiny Box Puffer prefers a tank of at least 70 gallons with plenty of space to swim. Water Conditions: Keep water quality high (SG 1.020 - 1.025, pH 8.1 - 8.4, Temp. 72 - 78� F). Feeding and Diet: Finely chopped meats such as shrimp, squid, clams and enriched krill would serve as an ideal diet to this puffer.